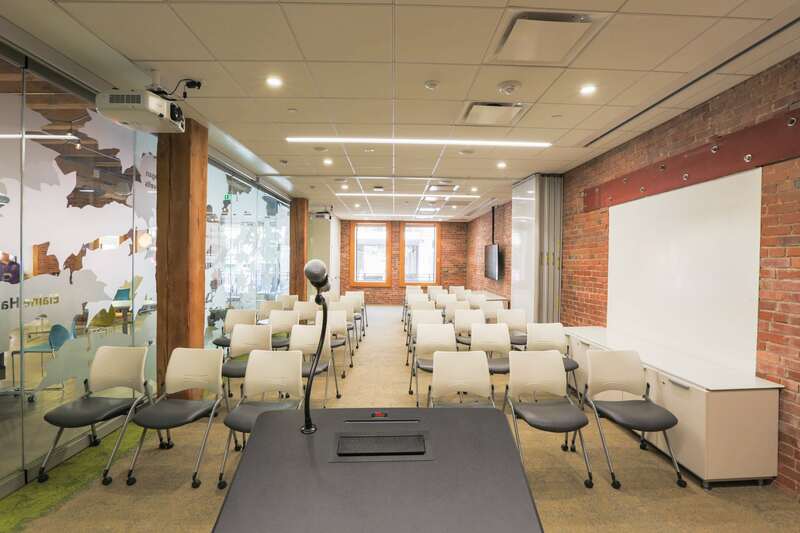 The Alliance Center event space is located in the heart of LoDo and is perfect for your next event. 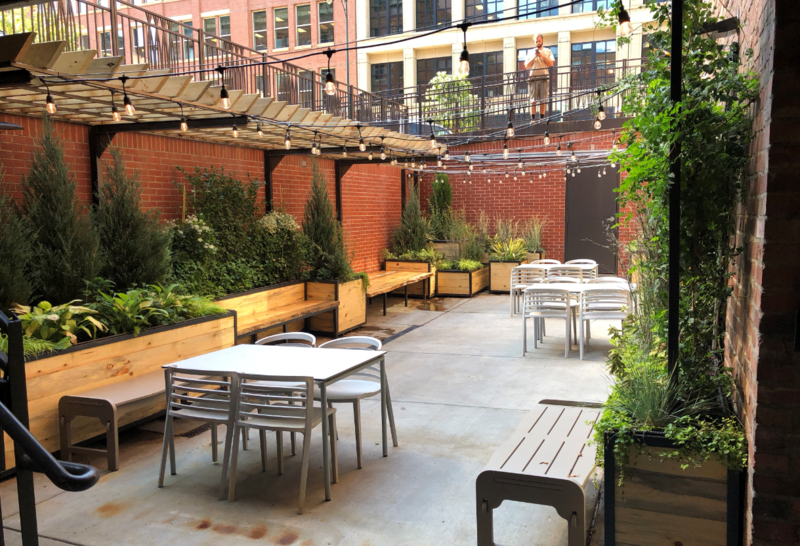 Our certified green event space is less than a block from Union Station, making getting here easy and simple. 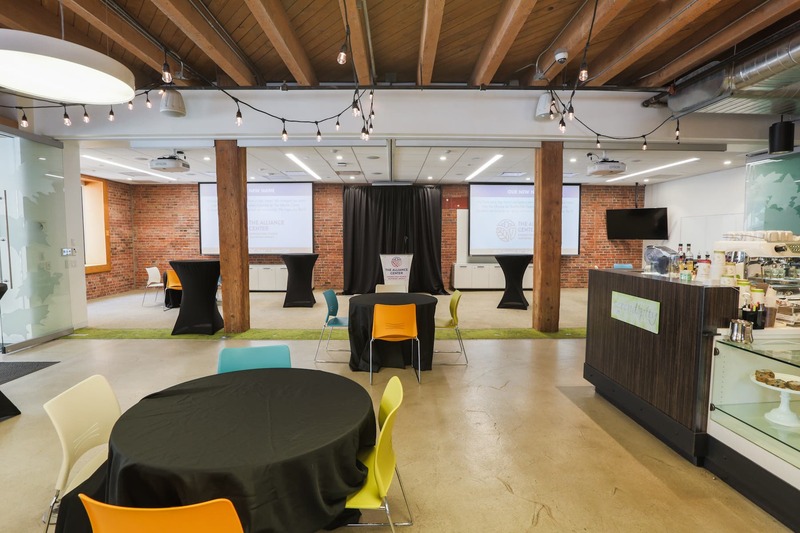 Our flexible event space, complete with movable walls and an in-house cafe, is able to accommodate groups from a two-person intimate meeting up to a 250-person networking event. Plus, we offer discounted rates for nonprofit organizations and B Corps! The Sustainability Center is our largest space, supporting events up to 250 people. It is perfect for your large training, donor or networking event. The Hub Café is perfect for your networking event or casual training, complete with bar service from our Serendipity Coffee Bar. Supporting up to 75 people, the Hub Café has six large windows for lots of natural light. The Centennial Room and Rocky Mountain Room are two rooms on our first floor, that when combined, create our Continental Divide Room. These spaces are perfect for your board meeting or other small gatherings of 6-14 people. 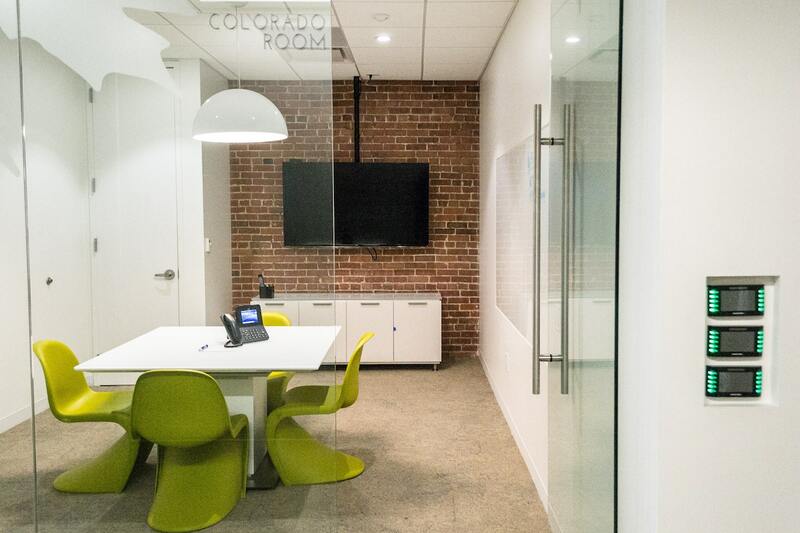 The Continental Divide Room is our most used and versatile space. Whether you’re looking for a boardroom meeting for 40 people or a theater panel for 75, this beautiful space will surely meet your needs. Can I bring in my own food and beverage? Yes, you are free to bring in your own food and beverage. However, dish ware must be either reusable or compostable, as we are a Certified Green Event Space. We also work with an array of amazing local caterers who all comply with our guidelines. Can I use different furniture? Yes, while our event space does come completely furnished, it is possible to bring in personal pieces or rent other furniture. Why does Serendipity Bar only serve beer and wine? There are different types of liquor licenses in Colorado. The liquor license that Serendipity Bar holds is a beer and wine liquor license and thus, they can only serve beer and wine. Can we schedule a tour of the building? Yes, one of our events team members would be happy to assist in a tour of the building. 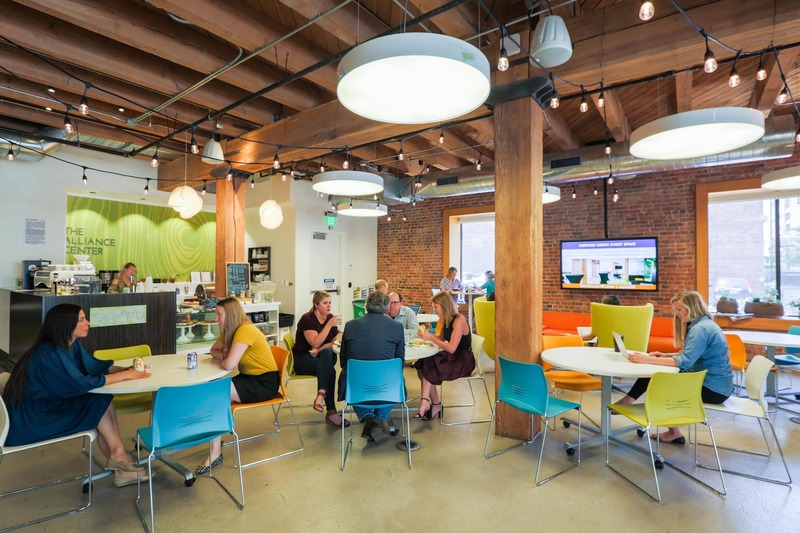 Tours can be scheduled by phone at (303) 454-3307 or by email at events@thealliancecenter.org. Will anyone be on-site for our event? Yes, included in the price of the rental fee is a dedicated onsite member of our events team. Why do we need to use compostable products? The Alliance Center is proud to say that we are a Certified Green Event Space, and in order to maintain our certification, we need to comply with certain requirements. Yes, The Alliance Center does have a kitchen with refrigerators, microwaves and sinks. However, it is not a full-service kitchen, as it does not have a stove or dishwasher to reduce our energy consumption. You/your caterer are welcome to use the kitchen, but we ask that if it’s during normal business hours that tenants still be able to access this space as it is the only kitchen in the building. Why are there extra fees to use the space on the weekends? The Alliance Center operates Monday-Friday so any events booked on the weekends are subject to extra fees during the weekend due to the need for HVAC, lighting, and cleaning, which normally would not run during the weekend. Given our work, we encourage public transit, biking, walking, or other alternative modes of transportation to get to our building. If someone has to drive, they can pay to park in our lot, which is $3/hour, up to $12 max. What is available for use in the event space? 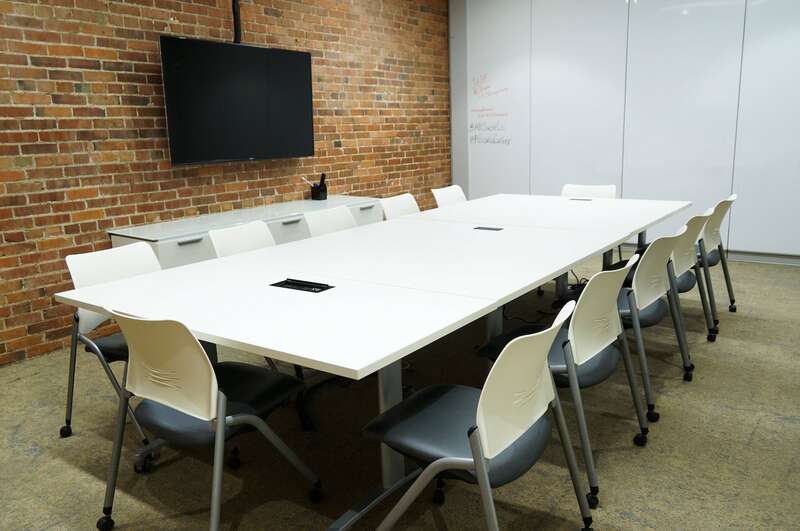 Our event space is equipped with furniture, microphones, screens and projectors, podium, whiteboards, phones, and all required hook-ups. For an additional charge you may also rent stage paneling. Does the Serendipity Café operate during events? Yes and no. If the event is taking place in our Sustainability Center the Serendipity Café will shut down, unless there is alcohol service. Otherwise, the Serendipity Café will remain open. I want to use an outside caterer but they don’t use compostable products, what should I do? In this case, you can ask your caterer if they can make the appropriate accommodations that comply with our Green Event Certification; we’re also happy to talk with them about these items. Otherwise, please bring in your own compostable products for the event. Do you have a calendar of upcoming events? Yes, we have a calendar of all of our public events listed on the website. We also have a number of events happening each week that are not open to the public and you can find the times the event space is unavailable under each room option. Can you help market my event? As Colorado’s hub of sustainability, we are occasionally able to assist in promoting events booked in The Alliance Center event space. 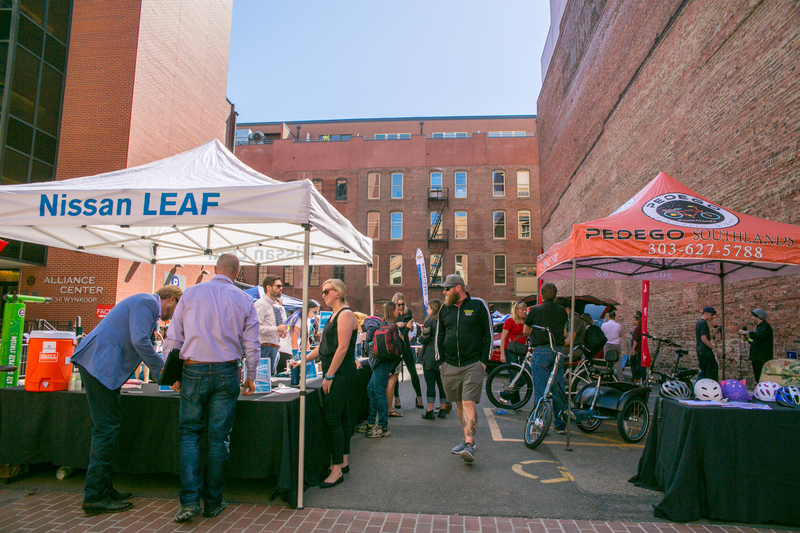 If a booking organization requests assistance promoting its event, The Alliance Center reserves the right to determine whether and to what extent to provide marketing assistance. If you’re interested in booking our space, please start by filling out our event inquiry form. For any custom requests or urgent questions, please contact our event team via email by clicking on the link below or via phone by calling 303-454-3307.